In honor of National Talk Like a Pirate day, I thought I’d explore just where the famous pirate accent came from and whether any real pirates spoke in the style we all associate with them today. After days of researching I have discovered that, in short, the answer is Hollywood and no. However, the story of how the accent came to be associated with pirates is still rather interesting. 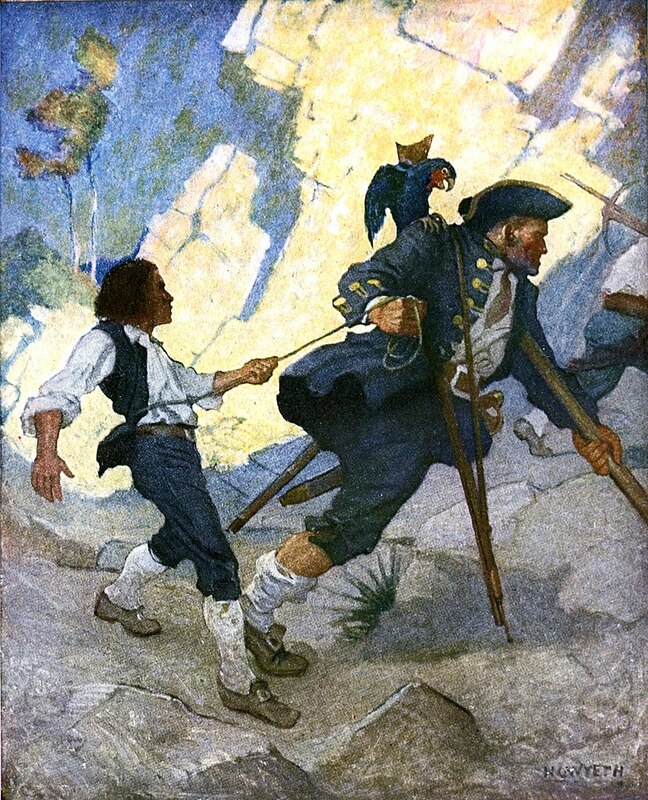 Jim, Long John Silver and his Parrot by N. C. Wyeth. Source: Wikimedia Commons. It all started with Disney. Fifty years before the first Pirates of the Caribbean film hit movie theaters, the House of Mouse premiered another live action pirate film series “Treasure Island” in 1950. Incidentally, this was the first live action film Walt Disney produced. Robert Newton was cast to play the infamous Long John Silver. To add some panache to his performance, the actor chose to endow the character with an exaggerated West Country English accent, with lot of powerful arrr’s. Newton’s performance was received so well by audiences, that he was cast as Blackbeard the pirate in 1952, reprised his role as Long John Silver in 1954, and starred in a Long John Silver tv series in 1955. Robert Newton single-handedly created the classic pirate image heralded by pop culture today. Well… almost single handed, I mean Robert Louis Stevenson did create the character. The idea for Stevenson’s book sprang from a pirate treasure map he and his step-son drew for fun on a rainy day in Scotland. In his novel, he combined elements from numerous previous pirate novels written in the 18th and 19th centuries to create the quintessential buccaneer. So if our modern conception of what a pirate looked like and talked like is based on fiction, does that mean everything we know about pirates is wrong? In reality, pirates came from diverse ethnic and cultural backgrounds. There were pirates of English, French, Dutch, African (in fact, at one point more than half of Blackbeard’s crew were of African descent) and Asian ancestry. Piracy did not only occur in the Caribbean in the 17th and 18th centuries. Probably the most successful pirate of all time was a female pirate named Ching Shih who roamed the South China Sea with a fleet of 300 ships in the mid-1800’s. (You can watch a video abut her HERE) Pirates plundered and pillaged ancient Greek and Roman Fleets.The ancient Egyptians spent decades defending their Northern coast from the mysterious Sea People. All in all, pirates are as difficult to define as they are to defeat at sea. But going back to pirate language, some of the words and phrases we associate with the notorious sea dogs do have roots in factual history and also lend credence to just how eclectic the history of piracy is. Let’s take a look at a few of these words. 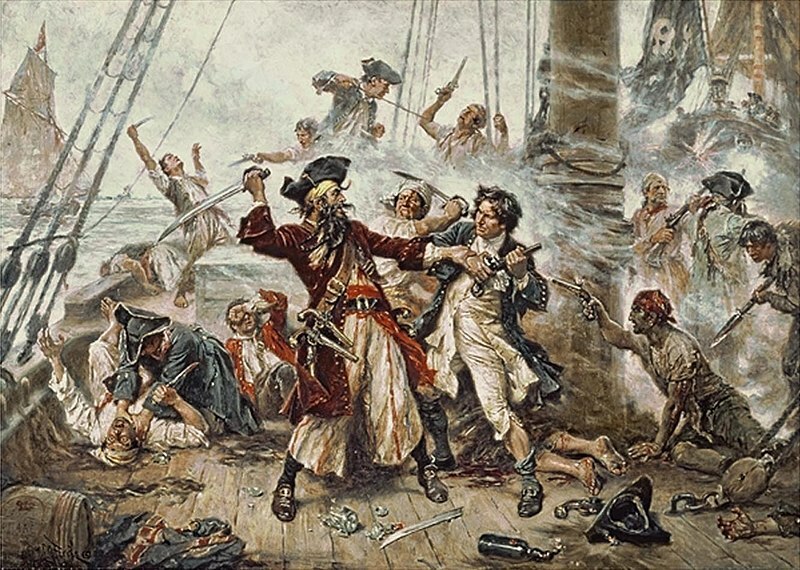 Capture of the Pirate, Blackbeard, 1718 depicting the battle between Blackbeard the Pirate and Lieutenant Maynard in Ocracoke Bay. Jean Leon Gerome Ferris, 1920. Source: Wikimedia Commons. Have you ever wondered where the word pirate even came from? The word comes from Greek peiratēs, which basically means “one who attacks”. The word fist appeared in English in the 14th century. This word comes from the French word boucan, which refers to a wooden grill used to smoke meats by indigenous peoples of South america and the Caribbean. The Spanish called this same cooking method barbacoa. That’s right, Pirates were the first barbecue enthusiasts! When the Spanish were first settling the Caribbean, they let loose pigs and cattle hoping that the livestock would proliferate and become a source of food for future explorers and settlers. Unfortunately this food source was also used by people on the run from the law or involved in illicit trade. They would prepare the meat native-style on boucans. Eventually these criminals became referred to by their choice cooking method. This term originates from the dutch phrase “houd vast” or “hold fast”. More of a general nautical expression than a pirate expression, this phrase still has a surprisingly dark origin. The phrase is commonly thought to refer to the cat of nine tails (a whip with about nine knotted strings) which was used by the Royal Navy to punish unruly seamen. The leather whip would be kept in a bag to protect it from drying in the salty sea air. The idea is that if something is amiss and you have something to hide, there’s no use in keeping your secret once the cat’s out of the bag. It may sound like a something that is definitely a Hollywood creation, but the earliest recorded appearance of this phrase dates all the way back to a play released in 1795 called Opposition. The phrase is uttered by an old sailor several times. Although the work is indeed fiction, who’s to say the language isn’t inspired by words uttered by real seamen of the time? You can see an excerpt from the play in THIS 1795 article. As in “swab the decks” or “you miserable swabs” this word comes from the Dutch swabbe, meaning “mop”. The word has been co-opted by English speakers for a long time now, its first recorded English usage was in the mid-1600’s, but it’s uncertain whether this word was was used by actual pirates to refer to subordinates. This word comes from the old English word Botye, meaning “spoils of war” and yes, it was in use during the golden age of Caribbean piracy, even in official documents describing the prizes Privateers could take. Next Post Starbucks Didn't Start The Pumpkin Craze, Mastodons Did!